This page shows how to use the Cocos2d SDK to implement these functions on the Android and iOS platforms. include: header files. Used in Cocos2d projects when modifying raw data. libs: library files. Only .jar and .so files in the Android folder are used on this page. Create a new Cocos2d project. Refer to here if necessary. Skip this step if a project already exists. 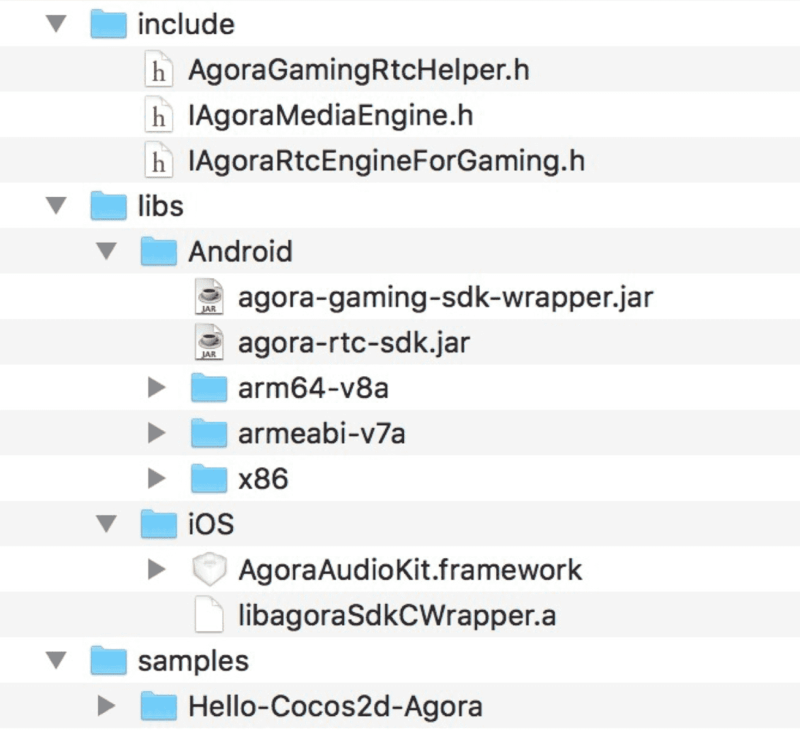 Create a new folder, such as AgoraGamingSDK, under the root directory of the project. Copy the include and libs folders to AgoraGamingSDK. b. Add a LOCAL_MODULE from agora-rtc, and then reference it. libs: library files. Only the framework in the iOS folder is used on this page. a. Select the current Target. b. Select Build Phases > Link Binary With Libraries. Select Enable Bitcode, and set it to No. Create a bridging file and name it MyAgora-Bridging-Header.h. b. Select Building Settings > Swift Compiler-General; set Objective-C Bridging Header to <Target_Name>/MyAgora-Bridging-Header.h. Call the APIs in Interactive Gaming API to implement the required functions.